The first amusement feature of the celebration the trades display, was an emphatic success. Indeed we would not overstep the bounds to say that it not only far exceeded the most sanguine expectations of its projectors and of all the citizens, but that it far overtopped any similar event of the kind in the history of our town. On every side and from every mouth, were heard expressions of approval of the display as an entirety, and of each and every feature. Both time, money, ingenuity and energy were expended on the affair and the result was eminently satisfactory. 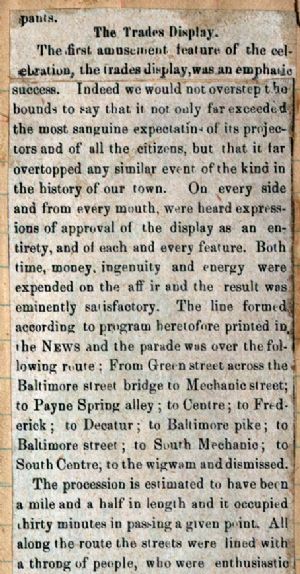 The line formed according to program heretofore printed in, the News and the parade was over the following route : From Green street across the Baltimore street bridge to Mechanic street; to Payne Spring alley ; to Centre; to Frederick ; to Decatur ; to Baltimore pike; to Baltimore street; to South Mechanic; to South Centre, to the wigwam and dismissed.